CM: Cross-disciplinary artist Sheila Pepe was invited to create the Common Sense Athens. Installation as part of the ACG Arts Festival 2012. This installation is Pepe's fifth take after namesake projects at Testsite/Fluent-Colab, Austin, TX (2009); Contemporary Arts Museum Houston, TX (2010); Tbilisi, Republic of Georgia (2010); and Carroll & Sons, Boston, MA (2011). Her Common Sense installations are site-specific web-like structures crocheted from domestic and industrial materials. Pepe has been working with string, rope and yarn as material for art since 1999. By doing crochet, she feels like relating to women historically and to a new generation of peers -including men- who are fascinated by this medium all over the world. She calls her installations "improvisational crocheted drawings" and sees them as colorful drawings in 3-dimensional space. Her aim is to preserve handicraft in a post-mechanical reproduction digital age. Furthermore, she uses traditional material to create an interdisciplinary environment engaging with art, architecture, biology, psychology and physical science. To tackle the public's tendency to look at the value of art as a marketable commodity, Pepe takes a domestic craft, brings into the contemporary high art context and returns it to the home. She uses craft to problematize the relationship between artisans, artists and designers. Furthermore, she designs installations to come apart rather easily by the prospect of pulling a string or severing pieces of them. Being interested in the performative aspect of her art, she invites the public to deconstruct her work by allowing them to claim of her installation whatever they deem useful for reuse. More importantly, Pepe's Common Sense is a paradigm of contemporaneity. The artist feels that craft is her means to reflect on various serious issues, which echoes Glenn Adamson's book "Thinking through Craft" (2007). Essentially, she claims her work is about solving prejudice on a racial, cultural, religious, sexual and ideological level. In other words, her art promotes multiracialism, multiethnicism, multiclassism, multiculturalism, multireligionism, multisexualism, multilinguisticism and generally pluralism. The fight against any kind of prejudice must always continue and claim our attention. Pepe's work unifies anyone engaging with it from all walks of life. She said that her Common Sense installations are "like boats in waters of diversity". After being dismantled, they carry on travelling in the "open sea" of our mind. 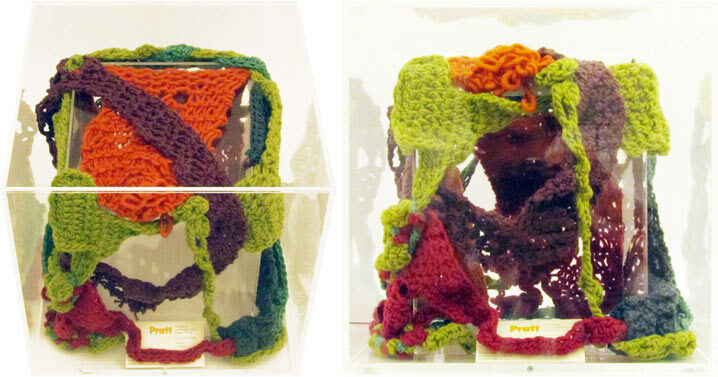 The present plexiglass case contains knitted fragments in every color used in the Common Sense Athens installation.